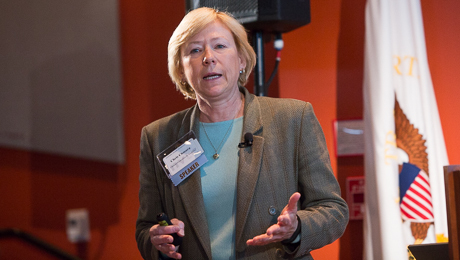 Virginia Science and Technology Campus hosts symposium on challenges, opportunities of big data. Leo Chalupa moderated a panel on growing the workforce for big data. Left to right: Dr. Chalupa, Keith Crandall, Gary Shiffman and Frank Stein. From wristbands that transmit the wearer’s location to sensors that map the human brain, the amount of available information about how we work, play and function has increased almost inconceivably in recent years. Data storage, computing power and intelligent software have evolved and are now able to manage and manipulate data sets too colossal to be analyzed by traditional methods. This is what’s called “big data and analytics.” It’s measured in tera- or petabytes—one petabyte being approximately equal to 250 trillion MP3 downloads—and could generate spectacular new models of behavior, leading to more accurate analysis and more effective decision-making across every field. And Northern Virginia—and the George Washington University—could be a hub for the opportunities big data presents, according to a new research report conducted by Chmura Economics & Analytics and released by the university, the Northern Virginia Technology Council (NVTC) and Attain, LLC. The report was presented on Friday at a symposium on GW’s Virginia Science and Technology Campus (VSTC), which was a major sponsor of the research. Greg Baroni, Attain chairman and CEO, called Northern Virginia "the nation's data capital." The Washington, D.C. region can and should be recognized as “the nation’s data capital,” said Greg Baroni, chairman and CEO of the event’s premier sponsor, Attain, a Vienna, Va.-based strategy, management and technology consulting firm, in his opening remarks. “Industry, academic and research leaders in this region, and the NVTC’s leadership in particular, truly believe that we have a unique set of powerful resources, knowledge and expertise to strengthen our leadership position in the big data and analytics market,” he said to a crowded auditorium in the National Transportation Safety Board Training Center. The university intends to be part of that leadership. “GW is making significant investments in big data, particularly with the Computational Biology Institute and the forthcoming genomics and engineering research institutes,” said Ali Eskandarian, dean of the VSTC and College of Professional Studies at GW. 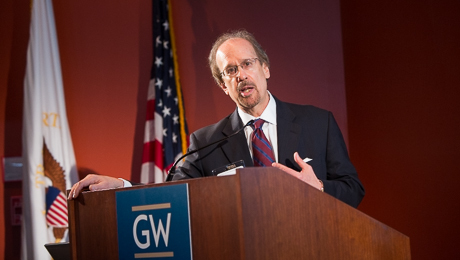 George Washington President Steven Knapp, who also spoke at the event, emphasized the centrality of big data to GW’s future research growth at VSTC. “We want to be part—indeed an essential part—of this region’s emergence as an increasingly powerful innovation-based economy,” he said. Christine Chmura, president and chief economist at Chmura Economics & Analysis, presented the report, which highlighted—among many other findings—the colossal amount of data generated by regional data firms; the high level of expertise in areas like national security, cybersecurity and health care; and an expected average annual employment growth over the next three years among big data and analytics firms in the region that is three times as fast as average annual forecasts from the U.S. Bureau of Labor Statistics for all occupations over the next decade. Christine Chmura, president and chief economist at Chmura Economics & Analysis. After the presentation, two expert panels convened to discuss the future of big data in the area. In the first, moderated by Dr. Chalupa, panelists fielded the difficulty inherent in growing the big data workforce. The panelists—Keith Crandall, professor of biology and the founding director of GW’s Computational Biology Institute; Gary Shiffman, president and CEO of data firm Giant Oak LLC; and Frank Stein, director of the Analytics Solution Center, IBM Federal—discussed the disparities between how educators train their students and what employers look for in prospective employees. “We have trouble finding employees with the right skills,” he said. When Dr. Chalupa posed a hypothetical about how the panelists would advise their college-age children to prepare themselves for the big data workforce, it became humorously clear that the question was not just theoretical. All three are parents, and all said they had emphasized to their children the importance of learning programming and computer coding—but all agreed that this had to be combined with domain expertise. For the D.C. region to truly become the capital of big data, said Dr. Crandall, it will need to invest heavily in fundamental data infrastructure: storage, transmission and internet capability. The second panel focused on the challenges and opportunities of big data, including privacy concerns, region-specific infrastructure, and new possibilities for development. The discussion was moderated by Anne Altman, general manager of U.S. federal and government industries, IBM Corporation. Participating were Mike Bradshaw, director of Google Federal; Don Brown, director of the University of Virginia Data Science Institute; Aneesh Chopra, co-founder and executive vice president of Hunch Analytics and former U.S. CTO; and Justin Langseth, founder and CEO of Zoomdata. The discussion was wide-ranging, but returned often to new questions of policy. 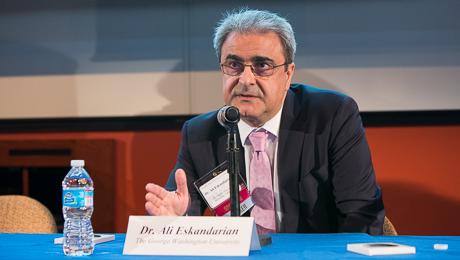 Ali Eskandarian, dean of the VSTC and the College of Professional Studies, emphasized the VSTC's planned investment in big data and its ties to Northern Virginia. And the symposium itself, Mr. Chopra said, by bringing together academics, policymakers and leaders of industry, was modeling what the region needed to do to make that happen.